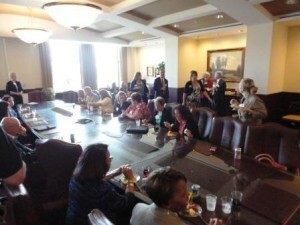 AKRON, OHIO – May 6, 2013 — ATHENAPowerLink® is a program of ATHENA International, an organization dedicated to creating leadership opportunities for women. ATHENAPowerLink® guides women business owners (WBO) in defining and achieving tangible goals by providing them for one year with access to aboard of business advisors hand-selected based on the specific needs of the business owner. On May 22 a Celebration Event in Akron will be held to recognize the success of the women business owners of Epcon Lane and Center for Marketing Opinion and Research (CMOR), and their Advisory Board members. The celebratory event will be held from 4:00-6:30 p.m. at the offices of Roetzel & Andress, 222 South Main Street, Akron. Roetzel & Andress, the Advisory Sponsor, led by Sue Ketler, Attorney, along with Dr. George R. Newkome, President, University of Akron Research Foundation, the License Sponsor, brought the ATHENAPowerLink® program to Akron. In addition to recognizing the business owners and advisors, the event is open to women business owners interested in learning about the ATHENA PowerLink program or in applying to participate in the next ATHENAPowerLink® program. Business owners, who are unable to attend but are interested in being considered for the next ATHENAPowerLink® program, should contact Cheryl Lyon, Lyon Capital Strategies for an application. Businesses must be 51% female owned, in business for two or more years and have achieved certain other performance requirements. For more information about ATHENAPowerLink® or the celebration event on May 22, 2013 contact Cheryl Lyon 330-869-4872.